The Paris area reeled Friday night from a shooting rampage, explosions and mass hostage-taking that President François Hollande called an unprecedented terrorist attack on France. His government announced sharply increased border controls and heightened police powers as it mobilized the military in a national emergency. French television and news services quoted the police as saying that around 150 people had been killed at a concert site where hostages had been held during a two-hour standoff with the police, and that perhaps dozens of others had been killed in apparently coordinated attacks outside the country’s main sports stadium and four other popular locations in the city. But estimates on the total number of dead varied. Witnesses on French television said the scene at the concert hall, which can seat as many as 1,500 people, was a massacre, describing how gunmen with automatic weapons shot bursts of bullets into the crowd. 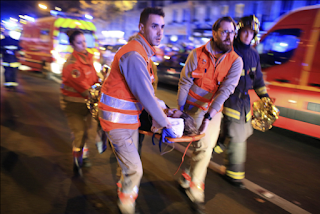 Those attacks traumatized France and other countries in Europe, elevating fears of religious extremism and violent jihadists who have been radicalized by the conflicts in Syria and elsewhere in the Middle East and North Africa.